The Bear Lake Loop Trail is 4 miles around. There is also a 6 mile mountain bike trail. The 1.3 mile Sweetwater hiking trail leads to another recreation area and the 2 mile Bear to Jackson Connector Trail leads to the 21.5 mile Jackson Trail. This is a very easy trail around a lake. There is little elevation gain. Watch for snakes and alligators, especially during the warmer months. The recreation area is open year-round. It is hot and humid during the summer and there are many biting insects. The spring and fall are ideal times for hiking in this area. Dogs are allowed on the trails and in the campground, on a leash. There is a $2 fee per vehicle entering the recreation area. Bear Lake Recreation Area is located within the beautiful Blackwater River State Forest. 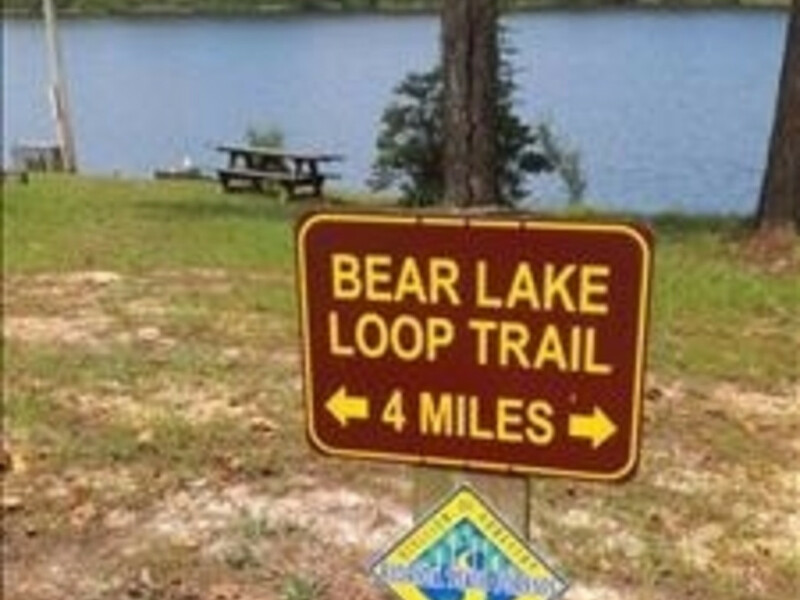 There is a 4 mile trail that makes a loop around the 107-acre, man-made lake. The trail is mostly shaded and travels through pine forest and over a few boardwalks. It also crosses the dam which forms the lake from Bear Creek. In addition to the 4-mile loop trail, there is a 6-mile mountain bike trail that also forms a larger loop around the lake. Other hiking trails are accessible from here too. The recreation area also has a campground that is first-come, first-served. All of the sites have water and some, electricity as well. The Bear Lake Loop Trail is a beautiful loop. It takes you around the entire 107-acre lake, over boardwalks, across a dam, and through a peaceful pine forest. The trail is not very technical and has very little elevation change. There are some roots but it is smooth overall. The lake is visible from the trail in many places, especially in the winter with less vegetation. Swimming is not allowed in the lake due to the number of alligators that live here, which you may find along the trail. However, fishing is allowed, and there is a boat ramp and a fishing pier at the lake. Electric motors and canoes are allowed on the lake but gasoline motors are prohibited. In addition to the loop trail, there is access to the Sweetwater Trail, a 1.3-mile trail that leads to the Krul Recreation Area, as well as the 2-mile Bear to Jackson Coonnector Trail. 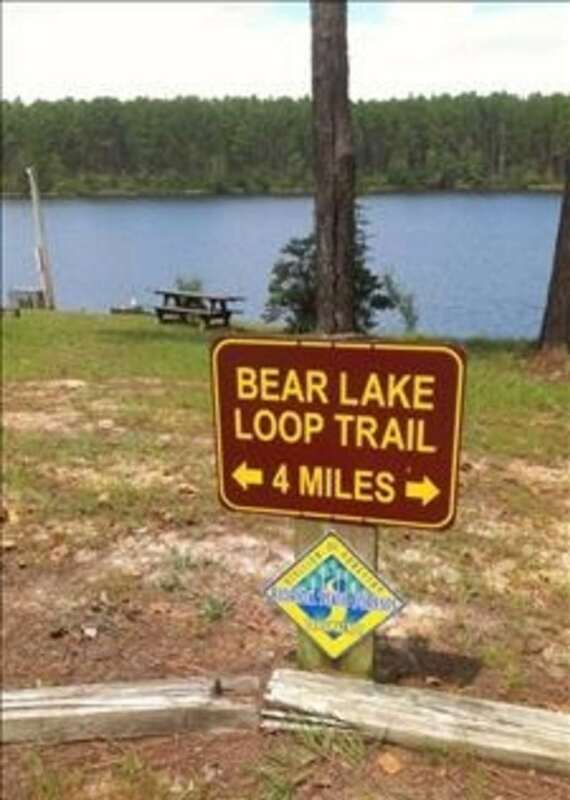 This trail connects Bear Lake to the Jackson Trail, a 21.5-mile section of the Florida National Scenic Trail. There is also a 6-mile mountain bike trail that forms a larger loop around Bear Lake. There is a campground that is first-come, first-served. Water is available at all sites and some sites also have a nice view of the lake. RVs and tents are allowed, and pets on leashes are also allowed in the campground and on the trails. Locals looking for a short hike to take after work or on a weekend morning will love this trail. It is great for families with children. The recreation area is a part of the Great Florida Birding Trail so birders will love hiking the loop and watching many species of year-round and migratory birds. There is a campground here also so it can make a perfect stop on a cross-country trip or a weekend getaway to the peace and quiet of the forest. Fishermen (and women) will also love Bear Lake, as it is home to many species of fish. Bear Lake Recreation Area is located on Bear Lake Road in the Blackwater River State Forest. It is approximately 2.5 miles east of the town of Munson, FL off of Highway 4. There is parking available at the end of Bear Lake Road at the lake and the campground. There is a $2 fee per vehicle using this area. Dogs are allowed on the trails and in the campground but must be kept on a leash at all times. There is a dining area available for rent in the campground. It must be reserved but the campsites are first-come, first-served. Restrooms with showers are available also.